The SMARTech system allows for integration with the home audio/video system and the multiroom system (multiroom amplification). The reason is comfort of the inhabitants, who can independently listen to their favourite music in their rooms, all coming from one set. This allows for full flexibility when choosing a sound source in any room, as well as elegance – only loudspeakers (e. g. hidden in the walls or ceiling) are visible in the room, as well as a small control panel on the wall, which can be integrated with the console controlling the light, heating, blinds, etc. The IR module can be used independently to control the flow of infrared waves in the house, or integrated with other systems. This means, that e. g. when someone enters, not only will the lights come up, the blinds go down or the temperature be raised, but also that the TV will switch on to a favourite channel or the software will play a desired CD. One can also e. g. turn down the sound of TV when someone would be calling on the phone. Examples are abundant, imagination will provide ideas for use. 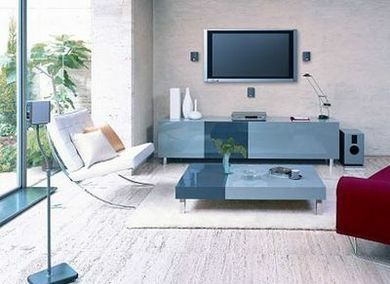 We also offer LCD panels (wall-mounted as well as portable) with a touch-sensitive display (up to 21″) replacing all remote controls (or even the TV or computer screen). The editing functions (also in conjunction with another computer) let you change and adjust all settings, upgrade the software or create own user menus, even with graphics. Being able to control the music from any room provides comfort. One remote control for all devices simplifies their use and helps keep order on the table. Upon recognition of the person coming, the system turns on their favourite music. The music server is able to store several thousands of records; this provides everyone with quick access to their favourite music. Visual control of all devices via a TV set simplifies the control. Voice communication with the house increases our feeling of comfort and safety.